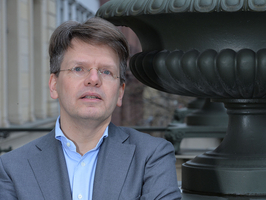 Christoph Möllers has made a name for himself in his native Germany as a brilliant jurist and a public intellectual. He has been selected for the 2016 Leibniz Prize in recognition of his outstanding work on public law, specifically constitutional law. His research spans a wide field from the theory and history of German Staatsdenken, the separation of powers, and theory of democracy to freedom of religion and constitutional jurisdiction. Möllers considers the core questions of public law from the perspective of democratic theory and enriches juridical thinking with a comprehensive theory of democratic legitimacy. He also brilliantly combines juridical, historical, philosophical, normative and political theory approaches and insights. However, his writings, such as "Staat als Argument", "Die drei Gewalten" and "Das entgrenzte Gericht" do not only set new standards in the study of law: they are also broadly received in the social and cultural sciences and enjoy high regard and wide distribution both in German-speaking countries and elsewhere. Christoph Möllers studied law, philosophy and literature in Tübingen, Madrid and Munich. After obtaining his doctorate in Munich and his habilitation in Heidelberg, he held professorships in Münster and Göttingen before taking up his current post at the Humboldt University in 2009. He combines his academic work with legal practice as counsel for the German federal government, the Bundestag and the Bundesrat and as a part-time judge at the Higher Administrative Court of Berlin-Brandenburg. In this capacity he has been involved in high-profile cases and decisions, for example on the request to ban the National Democratic Party of Germany, party funding and data retention, which have become subjects of legal research in their own right.